019979622X –Critical Thinking: An Introduction to Analytical Reading and Reasoning, Second Edition, provides a nontechnical vocabulary and analytic apparatus that guide students in identifying and articulating the central patterns found in reasoning and in expository writing more generally. Understanding these patterns of reasoning helps students to better analyze, evaluate, and construct arguments and to more easily comprehend the full range of everyday arguments found in ordinary journalism. Critical Thinking, Second Edition, distinguishes itself from other texts in the field by emphasizing analytical reading as an essential skill. It also provides detailed coverage of argument analysis, diagnostic arguments, diagnostic patterns, and fallacies. Opening with two chapters on analytical reading that help students recognize what makes reasoning explicitly different from other expository activities, the text then presents an interrogative model of argument to guide them in the analysis and evaluation of reasoning. This model allows a detailed articulation of “inference to the best explanation” and gives students a view of the pervasiveness of this form of reasoning. The author demonstrates how many common argument types–from correlations to sampling–can be analyzed using this articulated form. He then extends the model to deal with several predictive and normative arguments and to display the value of the fallacy vocabulary. 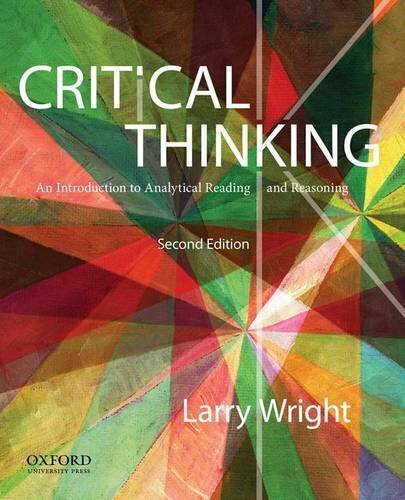 Ideal for introductory courses in critical thinking, critical reasoning, informal logic, and inductive reasoning, Critical Thinking, Second Edition, features hundreds of exercises throughout and includes worked-out solutions and additional exercises (without solutions) at the end of each chapter. An Instructor’s Manual–offering solutions to the text’s unanswered exercises and featuring other pedagogical aids–is available on the book’s Companion Website at www.oup.com/us/wright.